What makes negative feedback palatable and what makes it harder to digest? In my public life as a mediator, author, speaker and blogger, it comes down to this: The kindness of the delivery. Both readers wanted me to change something about the way I write here. Why, then, did I find the first so irritating and the second not so? They differed substantially in their kindness quotient. When a reader sends feedback, I am always grateful for their attention and usually grateful for the feedback itself, even when I decide not to accept it. I will almost always give negative feedback a fair shake before deciding what to do with it. It is easy to criticize from outside the arena (Brené Brown’s helpful measure). When I find myself reacting badly to negative feedback, it’s not the feedback itself that is usually the problem. Unkind delivery is the problem. Before I conclude something is unkind, I must test my reactive read. Even with my thick mediator skin, I sometimes have a brief internal struggle when I receive negative feedback that is unkind. In those instances, I must remind myself to look for the useful nugget amidst the nasty words. I can often find it eventually. I read the unkind feedback through twice. My first reading usually gets blurry from a flash of anger or hurt, so the second reading is necessary. I try to do the second read as though the message has come from someone I know and love, and I try to read it with a kind tone of voice. Occasionally, I forward it to my husband and ask for his assessment — he is reliable when it comes to kindness because he will always give someone the benefit of the doubt. Sometimes when I take these steps, I discover that the feedback is not so unkind after all; my own mood or initial reading caused me to misinterpret. If the email fails my kind-tone test, I set it aside and do not reply right away. I find that 2-3 days is a good delay for me. Once I no longer feel quite as wounded or angered by it, I return to it and write an abbreviated reply with as much appreciation as I can muster. I have become quite a fan of Carl Sandburg’s response for instances like these: “I shall try to do better.” It is inevitably true. 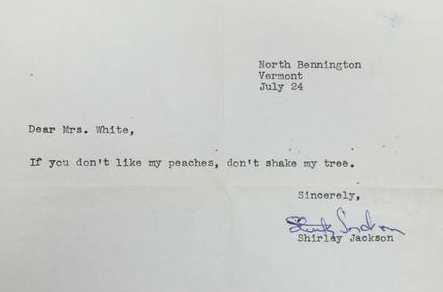 I try to avoid Shirley Jackson’s response, though I would very much like to use it now and then. Does unkind feedback deserve its own feedback? On very rare occasion, I see that an unkind feedback giver also happens to be a mediator. I struggle a bit more in these instances because I believe mediators should try to walk our own talk (even while I know we cannot possibly always succeed). “Thank you for the feedback. It was helpful for me to hear your opinions on ____. My own jury is out on this approach. Some days it feels right, some days I think I should have deferred to Carl Sandburg. Sometimes, it just brings more nastiness in return. I don’t continue the conversation when that happens. Life’s short.